Ever since my Dad got our first digital camera I’ve liked ‘sneaking’ out at night to take pictures of our Christmas tree. It’s never been that I would have gotten in trouble, though it was kind of embarrassing getting locked out of the house once when I was taking pictures of the snow fall… But that’s an other story. Why did it need to be a digital camera you ask? Just because of the ability to review the image almost instantly. I found out by accident at first how cool things look in the dark – the colored lights reflecting on the ceiling, or the patterns an unsteady hand makes in the camera. 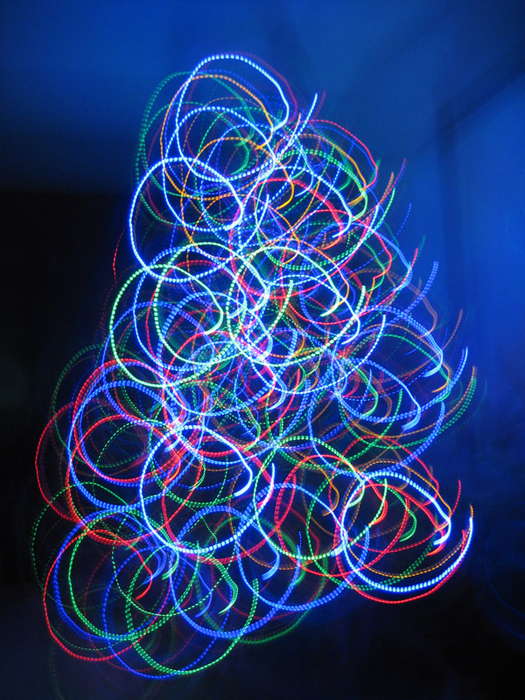 This Christmas tree is in my parents house this Christmas past, and the circles are deliberately made by moving the camera that way. I know it’s out of season now, but I thought I’d share it anyways.